Goldilocks & Her Doodle: Fabulous Friday! Yesterday, however, Milt Dog lost this honored privilege specifically because he has a penchant for ducks. Yes, those quackers. They will undoubtedly lead to his undoing one day. When Milton is let outside, he will quite often scamper down to the lake and return with wet paws and chicken legs. If I let him out, and frenzied barking, quacking, and a giant splash ensues, I know that the dood is in hot pursuit of a flock of mallards. There is actually one particular mother duck with a whole brood down by our dock, and when Milton nears, she will noisily paddle in one direction, creating a distraction, while urging her ducklings to take the opposite route, which will cause Milt, every single time, to race down the beach after the mom, who will inevitably begin to fly further out into the water, forcing Milton to swim after her. 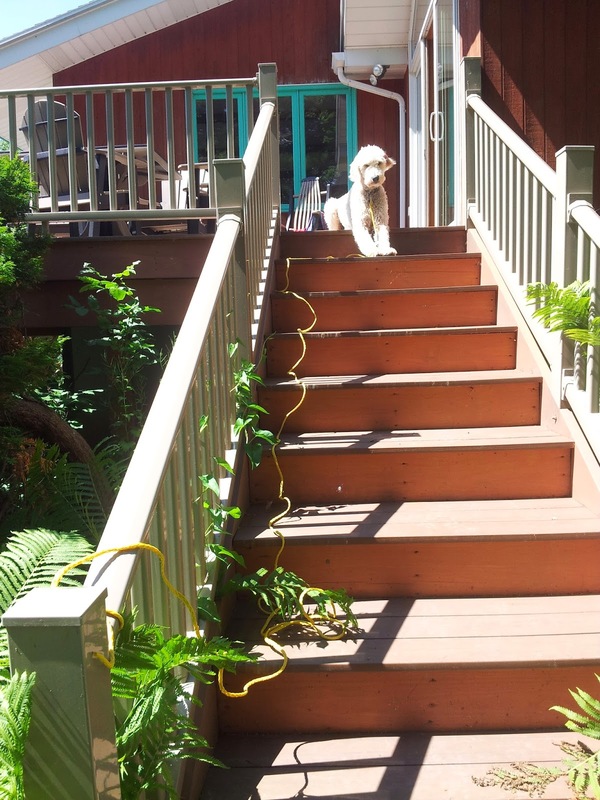 Normally, this is not too terrible of a situation because our cove is rather deserted (lots of retirees and summer homes), but this time, our playful goldendoodle ran off with his bright green tennis ball jammed in his mouth and stopped to visit a house of nearby summer renters. He ran out on their dock and demanded to play ball. As one of the renters explained to me, "I tried to get him to go back home by throwing the ball onto your property, but he just kept bringing it back to me!" Lady, that is called "fetch." What did you expect him to do!? After I hauled Milton back over into our yard, he immediately returned to their dock to continue the game. The underlying problem here is that Milt used to come racing when I called for him down at the lake, and now he does not. Sad but true. Awww he's just making friends. Welcoming everyone to the cove.